So naturally I was interested when I found his hymn of praise to Cybele online. I couldn’t find out anything about how it came to survive or what else is known about it so all I can say is what I have gleaned from the document itself. It sounds like a speech given at a religious occasion. I assume it was given in Athens, since the Athenians are specifically praised in it. And given that bits of it are rather unpolished and rambling it sounds a lot like it was a record made by somebody as the speech was being given. Reading it aloud took about 40 minutes, about the length of time a reasonable speech might take. As such it is a pretty rare chance to listen to someone speaking in their own voice from the ancient world. And it is a speech from one of the most interesting characters from that world. Very few people can talk to an audience off the top of their heads, so I imagine Julian had done some kind of preparation. Even so, his ability to talk on his feet is impressive. Accounts of him from his own time report that he was likeable and engaging, and reading this speech made that easy to believe. It is less easy to work out why he made it and to who. It sounds to me like he was consecrating a new temple, or more likely reconsecrating one that had been desecrated. Whoever was listening, Julian has high expectations of them. He doesn’t hold back on the full details of his Neoplatonic philosophy, and to follow him you would have to have a pretty good grasp of who Plato, Aristotle and Epicurus were and what their teachings were about. We get to hear what Julian himself thinks of these leading lights of Greek thought. Epicurus is dismissed: he is just plain wrong. Aristotle has made himself ridiculous by diverging from Plato. It is Plato that is regarded as the authority. Porphyry, who had reinterpreted Plato’s ideas for Julian’s time, also gets a respectful mention. As we’ll see, Julian is interested in how Cybele fits into the general metaphysical system of the Neoplatonist philosophy to which he subscribed. But today we probably first have to answer the more basic question of who Cybele was in the first place, given that she isn’t one of the gods whose name is still a part of everyday speech. The cult of Cybele goes back a long way, and she may well have originally been worshiped as an earth mother way back in prehistory. The origin of her worship was in Phrygia. This is the region of central Turkey roughly where the current capital of Ankara is. There are a lot of respectful and knowledgeable references to Phrygia and its culture in the speech, enough to make me think that there may have been some Phrygians in the audience, or indeed the speech may have been given somewhere in Phrygia. The Phrygians were closely related to the Greeks, and early on the Athenians had picked up the worship of Cybele from them. There was a temple to Cybele in Athens which also contained the public records. The Phrygians must have had a good marketing department, because when the Romans were in trouble during their war with Carthage they turned to Cybele for divine support. 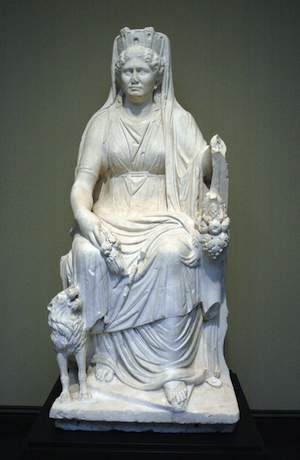 A statue of the goddess was commissioned from Phrygia and dispatched to Rome in a large ship. When the vessel approached the Tiber the city’s inhabitants turned out to greet it, led by the priests and senators. Unfortunately it got stuck in the mouth of the river, and nothing would move it. The rumour arose that the chief vestal virgin, Clodia, had not been sticking to the purity of her vows and this was offending the goddess. Stories like that tend to spread. In order to clear her name Clodia wrapped her girdle around the statue. As a result the boat finally started moving getting the delivery back on plan. Julian was telling this story some five hundred years after the event but had no truck with people who were skeptical about it. Julian insists on taking the story at face value. There were plenty of testimonials attesting to it. It also fitted in with his idea that the gods took an active interest in human affairs, intervening when the need arose. The Romans went on to be highly successful in their fight against Carthage. Cybele was obviously effective as a protector. She rapidly became one of the most popular gods in town. Augustus built a huge temple to her right next to his own palace. But Julian is just as interested in her religious significance as her history. He asks, who is the mother of the Gods? He then proceeds to answer his own question in great detail. As a pupil of Neoplatonism he was intensely interested in the metaphorical significance of these kinds of myths. We get a lot of detail of the philosophical meaning of it all. This is pretty involved, going deep into Plato’s theory of forms and with references to Aristotle, Porphyry, Theophrastus and Xenagorus. And this isn’t simple name dropping. Julian has clearly read them and understood their arguments and feels quite able to put his own ideas forward in the same company. It is tough going, believe me. But he eventually gets where he wants to go. Cybele is identified as the greatest being created by the One, and the god who transfers creative urges from the Divine Mind down to the Earth. Having warmed up with this, fairly major, metaphysical explanation he goes on to draw some conclusions about how one of the stories about Cybele could be used to explain the path of the Sun in the sky. He then seems to get a bit sidetracked with quite a bit of rather unfocused speculation about the origin of particular dietary restrictions required by traditional religious practices. As we all know, the cleverest of speakers can wander off topic and end up forgetting what they are supposed to be talking about. But Julian pulls it back. He finishes with a simple and sincere prayer to the Goddess. The reference to the stain of atheism is poignant. Julian may have been making a general point, but I can imagine that he was speaking in a temple that still had signs of damage. Atheism referred to Christianity. Christians do not accept the Platonic concept of a single transcendent God who is the source of creation, so the atheist tag can be justified from Julian’s point of view. To our way of thinking it is a bit confusing. Many temples had been attacked and destroyed during the previous forty years, many converted into churches. Julian’s love and veneration for the gods of his country is evident, and he must have found the evidence of this desecration heartbreaking. But the buildings could be restored – the loss of the tradition was much harder to make good. This culture, once destroyed, could not be revived. Julian himself, being brought up as a Christian must have felt keenly this break with the past. But at least as emperor, he could now save what was left. But it was not to be. His reign was not even to last two years, and when he was gone it was not long before the destruction resumed. Steadily more severe laws against pagan practice were brought in, stripping them of rights and forbidding their literature.Paganism did not die out, it was killed. Much of our culture has been lost forever. Julian failed to save it, but at least he put up a fight, and a visible one. Julian will certainly never be forgotten. His Hymn to Cybele is both a window on a world that has been destroyed and a reminder that people cared deeply about it.